Q Collective has been very busy. Consider this a glimpse of what we have been working on. Very soon we will provide more information on each of these projects and more. We designed a typemark and visual system for the exhibition Void, a solo installation by artist Stephen Hendee. The bold typeface, Monod, is the primary element of the system and was chosen for its geometric form and unusual proportions. It is used throughout the print materials and complements the futuristic forms in the sculptures. Building off the visual language established for the Void exhibit, the new website is a living portfolio of Stephen Hendee’s prolific and multi-disciplinary art practice. Developed to be easy to maintain, all areas of the site are editable while newly created content is automatically formatted to present a unified portfolio of Stephen’s varied work. A culmination of a three-year process of research, writing, and design, the 7th edition of Typographic Design: Form and Communication will be published in early 2018. The newest edition looks at typographic design—analog, digital, and motion—as a unified discipline and establishes common fundamentals across mediums, while emphasizing medium-specific considerations. 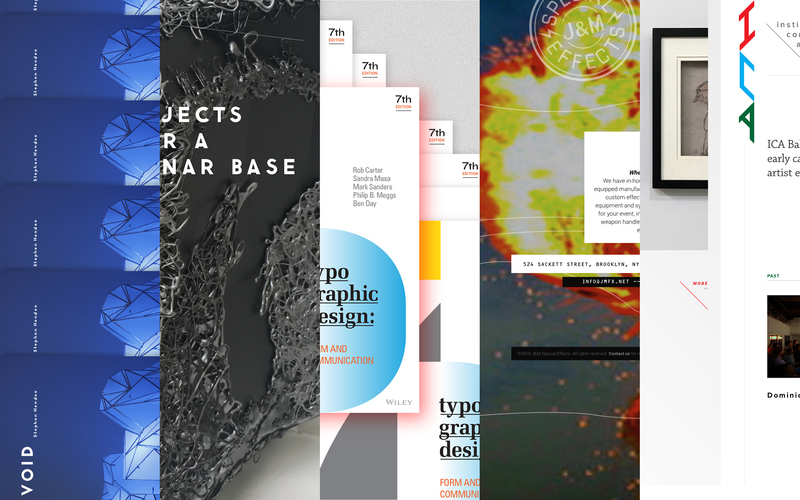 Many new typographic Case Studies have been added as well as projects for educators. J&M Special Effects approached Q Collective in 2008 to develop a website that is a product catalog, portfolio, and resource library for their clients. After serving the company well for 8 years, we have now completed technology and design upgrades that will hopefully keep the site useful and spry for another 8 years. The ICA Baltimore is a nomadic, non-collecting arts organization that provides studio visits and gallery space to mid-career artists. Since the ICA shows artists in many places, it has been difficult for them to provide information and promotion for upcoming exhibits. Even more difficult is signifying the organization in galleries that have their own identity. Q Collective created a flexible identity that easily adapts to a variety of surfaces, and a website that promotes current and upcoming exhibits, as well as acts as a catalog of previous shows.